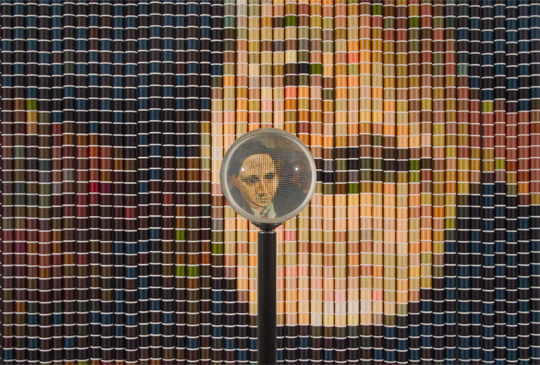 At first glance, the installations appear to be a random arrangement of spools of thread. 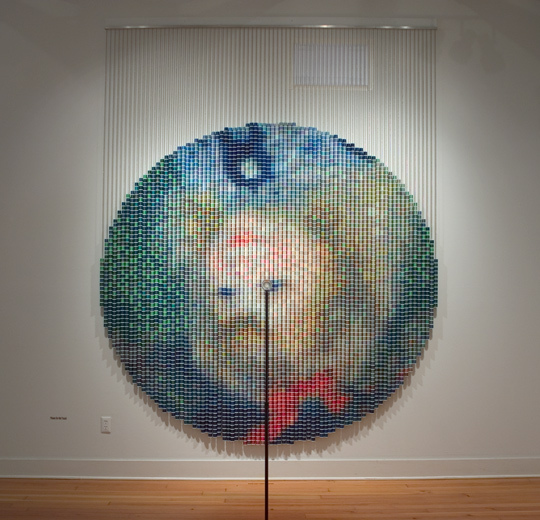 Clear acrylic spheres placed in front of the works, shrink and condense the thread spool "pixels" into recognizable images while also rotating the imagery 180 degrees like the human eye. This shift in perception functions as a dramatic mechanism to present the idea that there is no one truth or reality, emphasizing subjective reality vs. an absolute truth. 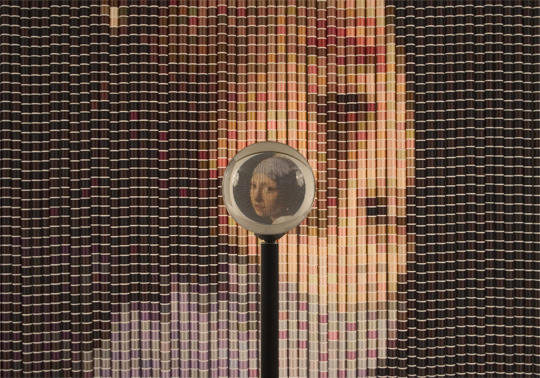 After Renoir is one of six thread spool works which are based on the centered-eye phenomenon in historical portraits. 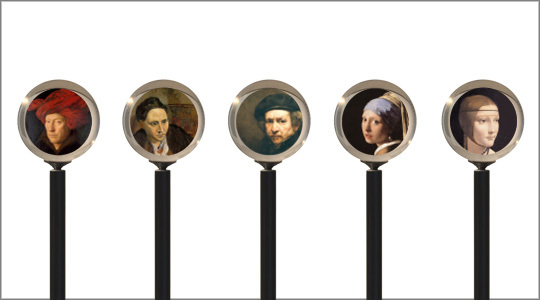 The other five works are based on portraits by da Vinci, Vermeer, Picasso, Rembrandt, & Van Eyck. 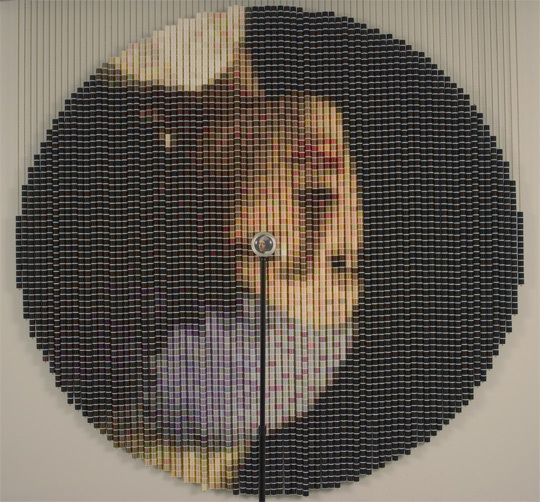 This concept was inspired by a recent scientific survey by Christopher Tyler of 3/4 view portraits over the past two millennia which revealed that one eye tended to be placed symmetrically at or near the vertical axis of the canvas throughout the history or Western portraiture. While Renoir's A Girl With a Watering Can did not meet the criteria of Tyler's study (he only surveyed portaits from the waist up), the symmetry, soft focus, and color scheme compelled me to select it as a subject matter. 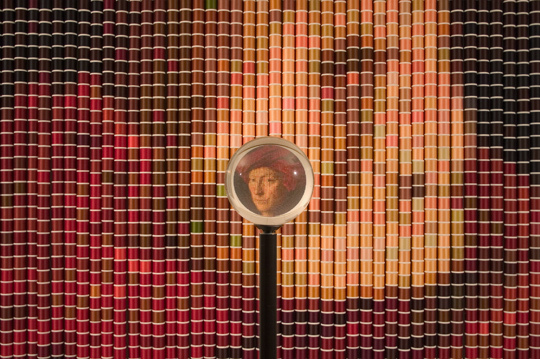 My current body of work consists of sculptures assembled from thousands of ordinary objects -spools of thread, marker-pen caps, map tacks, or chenille stems, combined with optical devices such as clear acrylic viewing spheres, convex mirrors, or reversed binoculars. While many contemporary artists utilize digital technology to create high-tech works, I strive to "dumb-down" technology by utilizing mundane materials and low-tech, labor-intensive assembly processes. I place equal emphasis on the whole recognizable image and how the individual parts function as abstract elements, selecting materials based on aesthetic and functional characteristics as well as for their capacity for a compelling and often contrasting relationship with the subject matter. My interest in the biology of vision grew from my desire to understand how viewers experience my work. 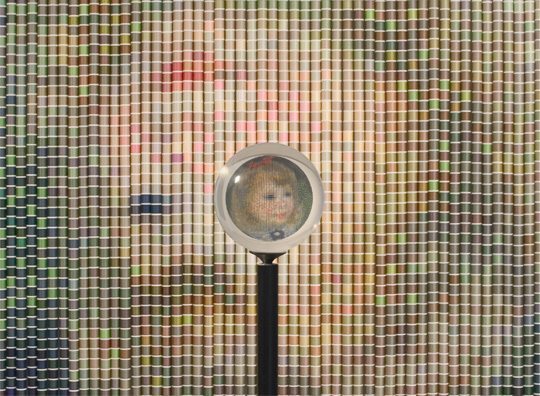 The six eye-centered portraits illustrate specific visual experiences related to the biology of vision such as: how the human eyes and brain process sensory data-- Photons bouncing off the spools of thread reach our eyes where they are turned into a pattern that is sent to the primary visual cortex where the rough shapes are recognized. 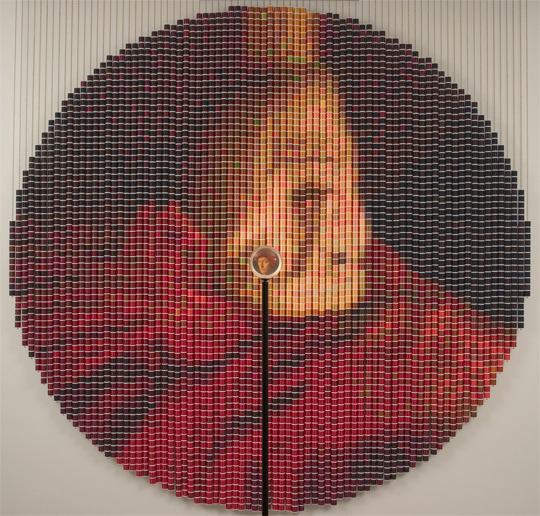 The pattern is then sent to higher regions where colors are recognized and where thread spool identities are encoded along with other knowledge we already has about thread spools. This direction of flow is called: feed forward, meaning the data is moving from bottom to top (eyes to brain). Bundles of nerve cells carry information. Traffic flowing from top to bottom is called feedback or top-down processing. There are 10 times as many nerve fibers carrying information down as there are carrying it up. So what we see is based on what neuroscientists call "top down processing." And what we see depends on the framework built by past experience that interprets raw data. 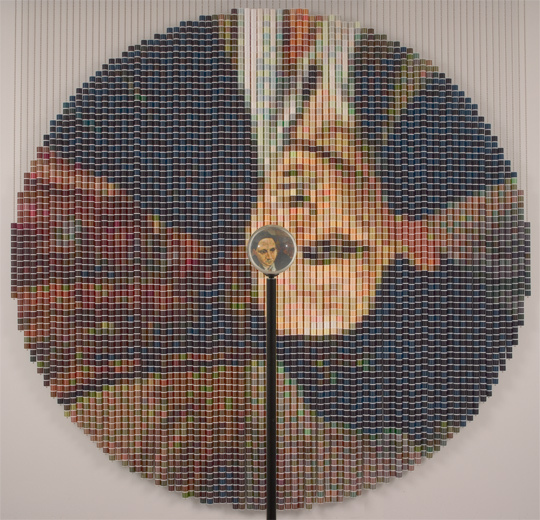 When the top (or brain) is convinced it knows what it is seeing (in this case, initially fixating on what appears to be a random arrangement of thread spools), the bottom level of data (the recognizable portrait) is overruled. 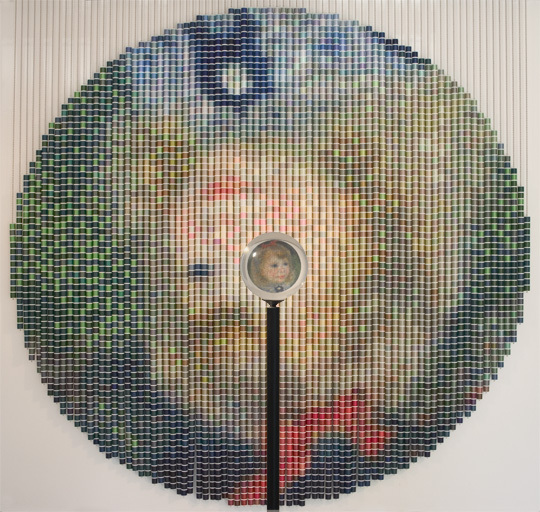 This may explain why my use of thread spools create such a jolt or 'WOW" experience when the viewer finally sees the representation imagery in the viewing sphere, as the brain abruptly shifts focus from the individual spools to the whole recognizable image. 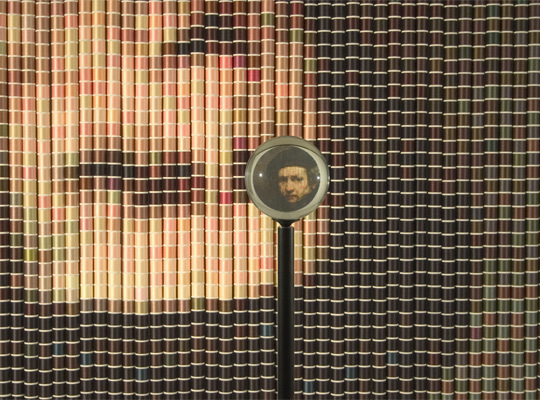 The brain can only hold or assemble one image at a time, so its initial fixation on the individual spools does not allow the recognizable portrait to emerge until the thread spools are seen through the viewing sphere or from a significant distance. 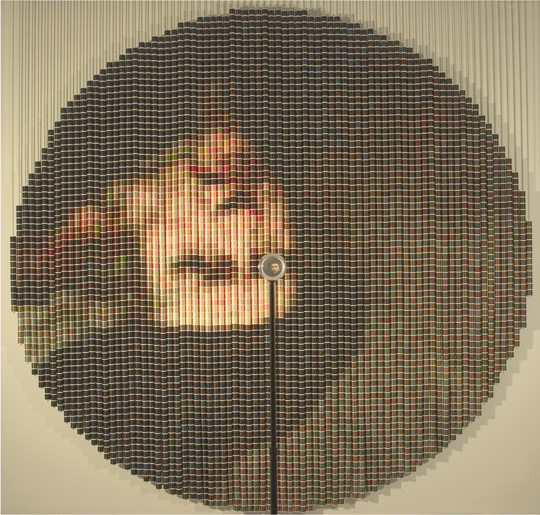 However, once the viewer "sees" the image in the thread, the brain can shift back and forth from focusing on the individual spools to the whole recognizable image. And once the viewer "knows" the image is visible in the thread, he or she can not erase it. Thus, these works function as neurological primers, literally priming or teaching the brain to make sense of visual imagery it has not yet been exposed to.